UCSC professor Warren Sack's "The Software Arts" argues that computing grew out of the arts, challenging the notion of division between the arts and the sciences. Drawing from his background as a media theorist, software designer, and artist, Sack explores the theories of online public space and discussion. During his talk, Sack gave a short overview of the emerging field of software studies. Additionally, he offered chapter-by-chapter summaries of his upcoming book and read some passages from a few of the chapters. Watch the video below or directly on Youtube. History and Theory of New Media Graduate Liaison Renée Pastel recaps Warren Sack's lecture "The Software Arts," on March 1st, 2017. 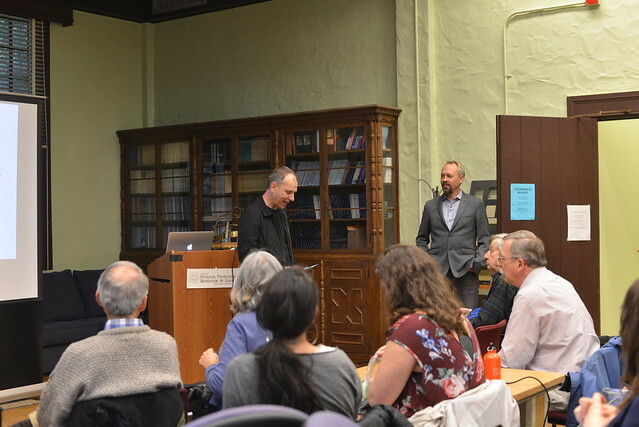 Returning after his insightful part of the panel discussion at the Fall one day symposium, “Between Digital and the Political: New Ecologies of the Mind,” Professor Warren Sack of UC Santa Cruz’s Film and Digital Media department visited the History and Theory of New Media lecture series on March 1, 2018, to preview his forthcoming book, The Software Arts. Sack argued passionately that computing grew out the Arts, and that the line between computer science and computer arts must be questioned and ultimately re-evaluated. He gave an extremely organized talk, sectioning his presentation into three parts. In the first, he gave an overview of the burgeoning field of software studies, noting the field’s new prominence in job postings and comparing it to the position of “new media” studies twenty years ago. Contending that much of computer history has focused on hardware, Sack proposed that an Science and Technology Studies approach to software misses the text and the media/art component that is inherent and intrinsic. This re-evaluation of software as blooming from art has implications for pedagogy, technology and the epistemology of the field, according to Sack. By reading code as a type of prose, and considering computing as a form of language art, Sack points to the hope of reintegrating philosophy and math and the importance of the liberal arts to computing. Having introduced the topic, Sack next gave a chapter breakdown of his book, tracing his arguments through chapters on Translation, Language, Algorithms, Logic, Rhetoric, and Grammar. Beginning by gesturing to computer languages as originating in 18th century French artist and artisans and building an argument for a reconsideration of software as an art form too long mis-categorized as purely mathematical, Sack finished by coming to the political artistic stand that a reconsideration of software offers, allowing software to be seen as that which an individual must use to remake meaning, thus engaging as an artist. He concluded his talk by focusing on a passage from the fourth chapter of his book, on Algorithms. This passage suggested that algorithms function similarly to a cookbook, an analogy that opens algorithms to be considered on a literary level. Sack ended by pointing out the imbalance in American education created by a valuation of math and science over art, and indicated his desire for some of that balance to be restored by reclaiming the artistic roots of software and computing. The Q+A permitted Sack to expand upon some of the ideas raised in his talk, from explaining how his current pedagogy already incorporates software and data science as art, to a deeper exploration and explanation of the art and science continuum, to the distinctions between craft and art and how Sack envisions software fitting into that spectrum. This period also allowed a further delineation of terms and how Sack sees the current state of software studies as existing in the intersection of many viewpoints—the writer of code, the machine, the executioner, and those interacting with its output. This stimulating presentation and Q+A were a great end to the 2017-2018 HTNM series! Sacks will argue that computing grew out of the arts. This argument will be a provocation for some, especially for those who see a bright line dividing the “two cultures” of the arts and the sciences. For others, the argument will not seem provocative at all. Important computer scientists have argued that computing is not a science, software is a literature, and computer programming is a kind of essay writing. For those who see no clear distinction between the arts and the sciences, The Software Arts will be an old saw with some new teeth.